The arched, decorative gate and knuckles on the fencing. 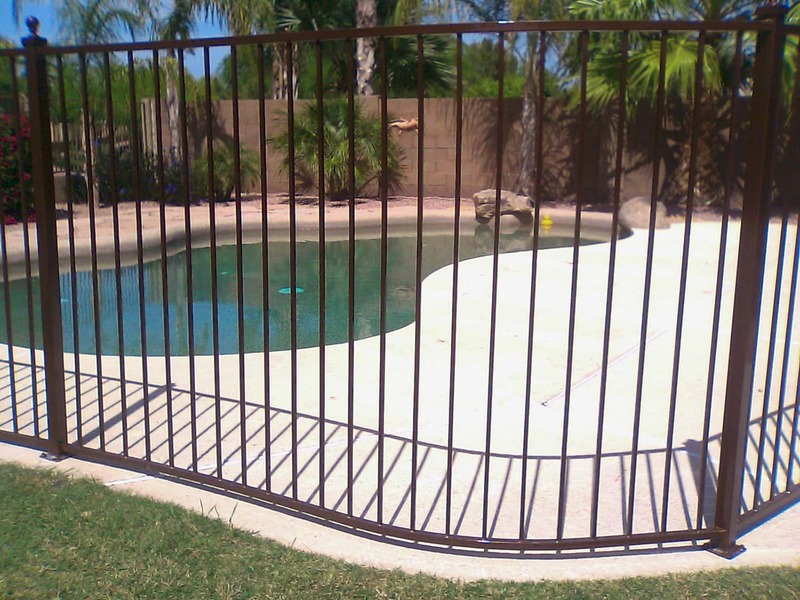 This is our most popular pool fence and gate we install. The arched, decorative gate with the hand-hammered Italian scrolls sets off the balltops on the posts, and the fencing and gate all use decorative knuckles on alternating pickets throughout. This color shown is our Navajo White Polyurethane. 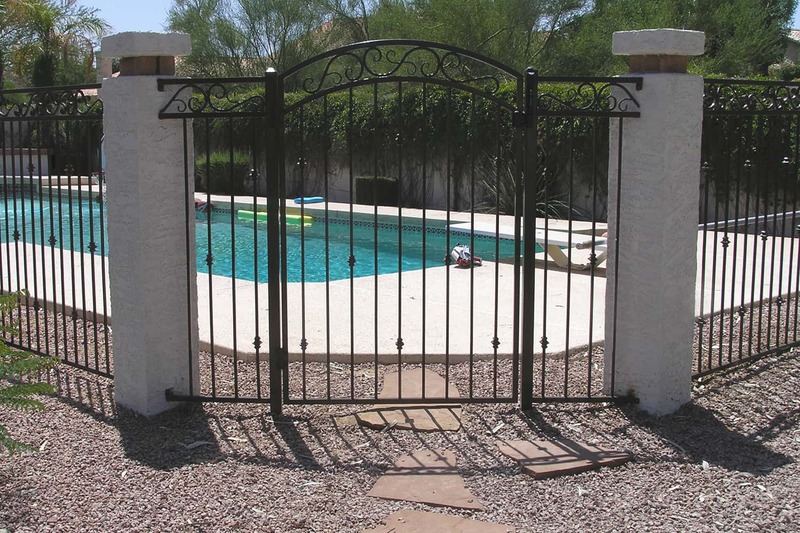 Double decorative arched pool gates. 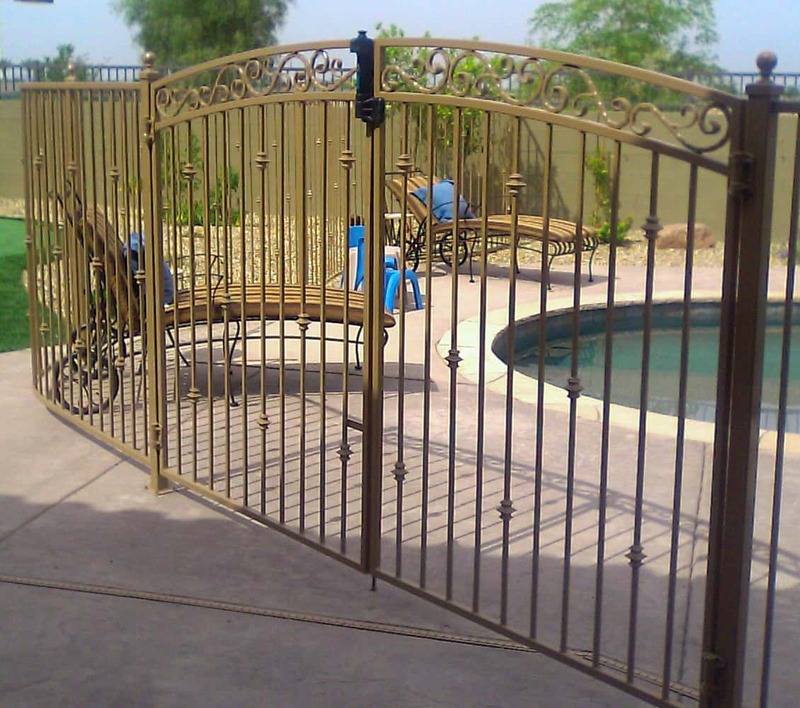 The double gates shown here allow an entertainment area to be opened into the pool area for those special times. 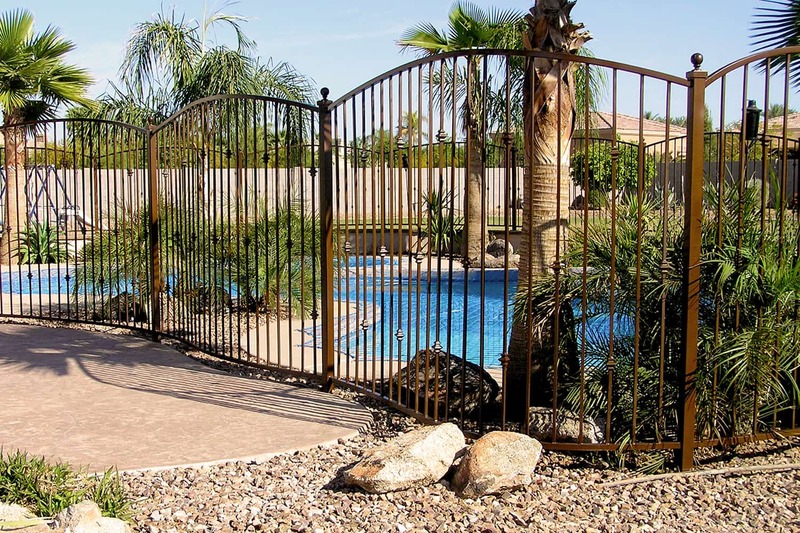 The rest of the time, it is a beautiful, protected entry to your pool. Note the Magna-Latcht at the top of the gates. 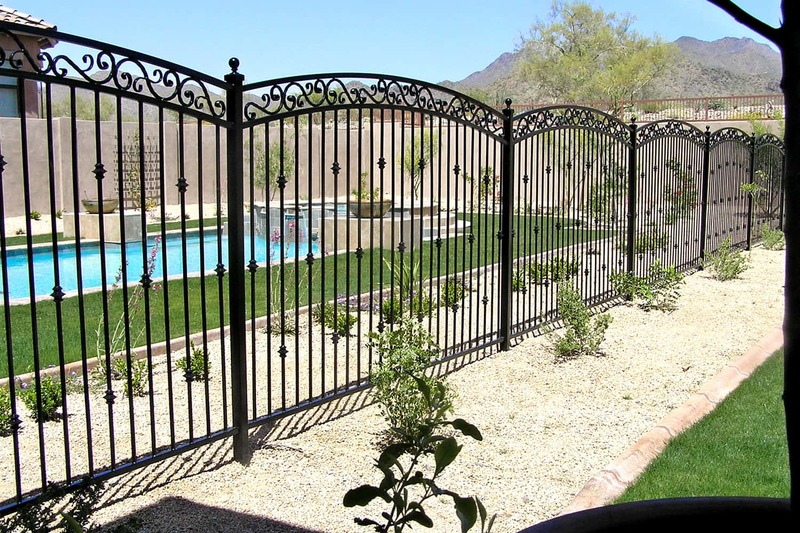 3-rail arched decorative pool fencing with scrolls. 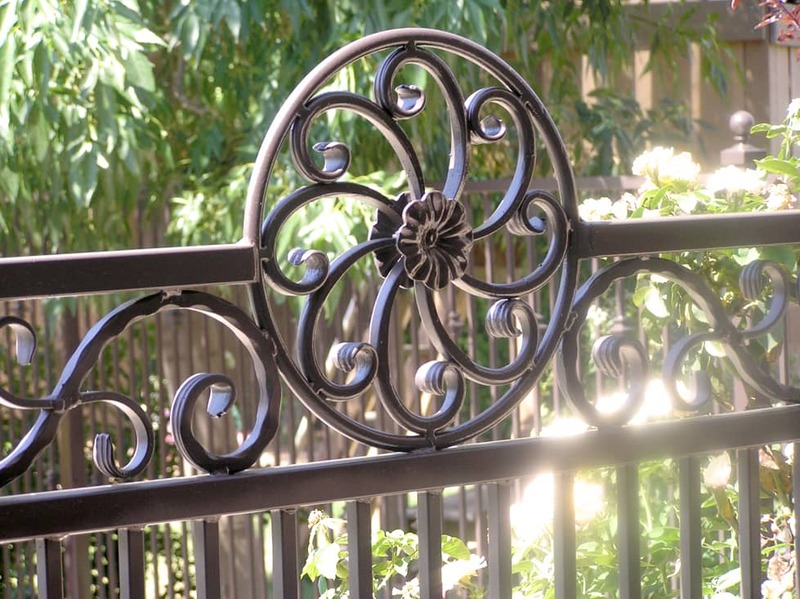 The hand-hammered Italian scrolls arched throughout this fencing help set off this beautifully landscaped backyard. 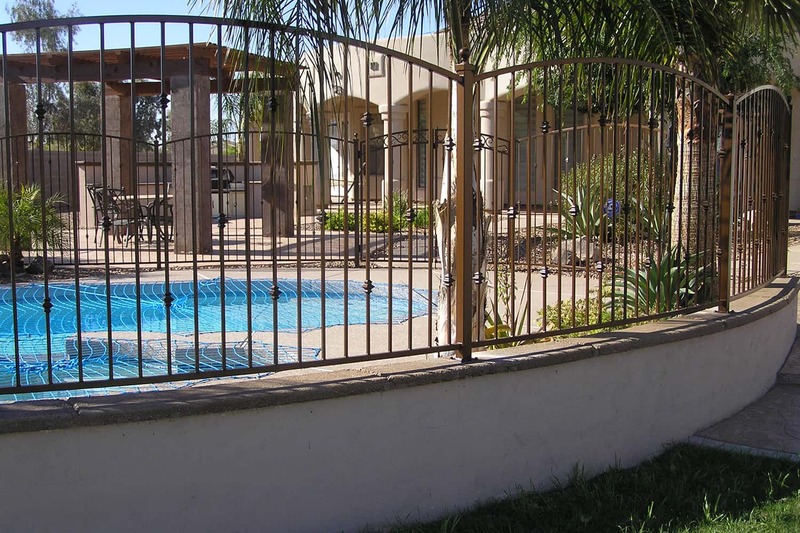 Decorative arched pool fence with knuckles and ball tops. Decorative arched fencing on a masonry pony wall. Safety ball spears on this decorative pool fence. 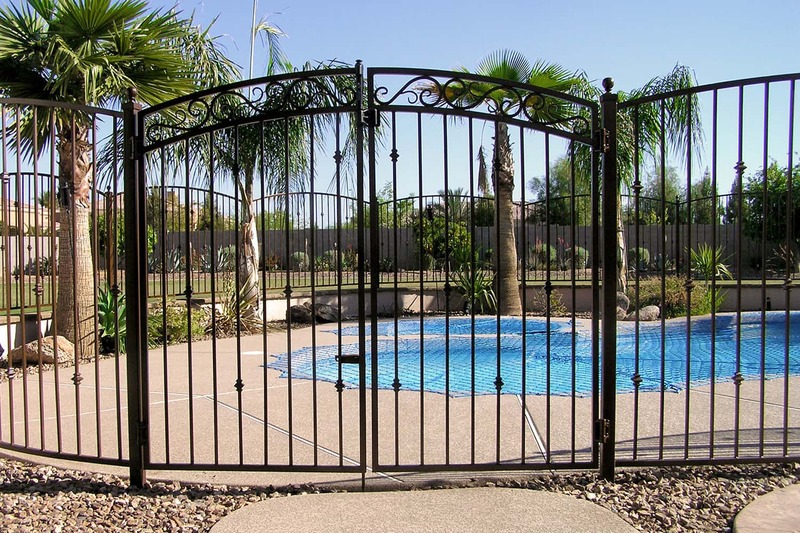 Pool fence with decorative knuckles and gate with a simple arch. 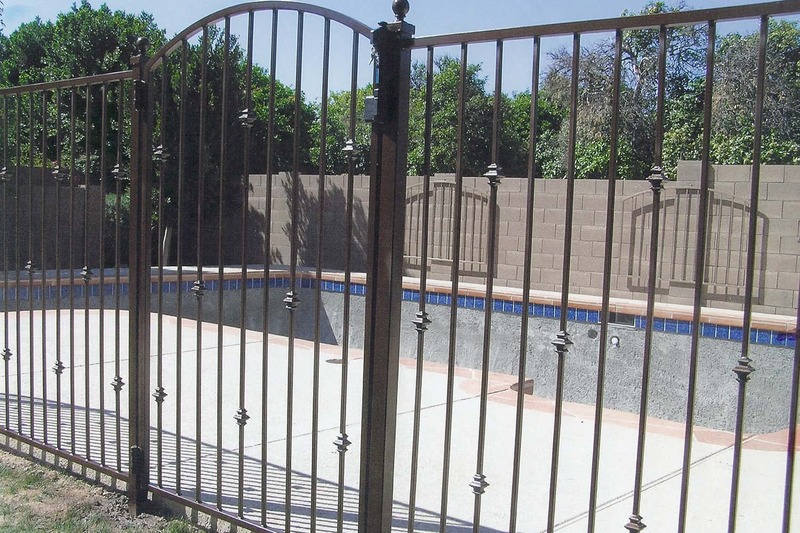 Classic pool fence with an arched, decorative gate. 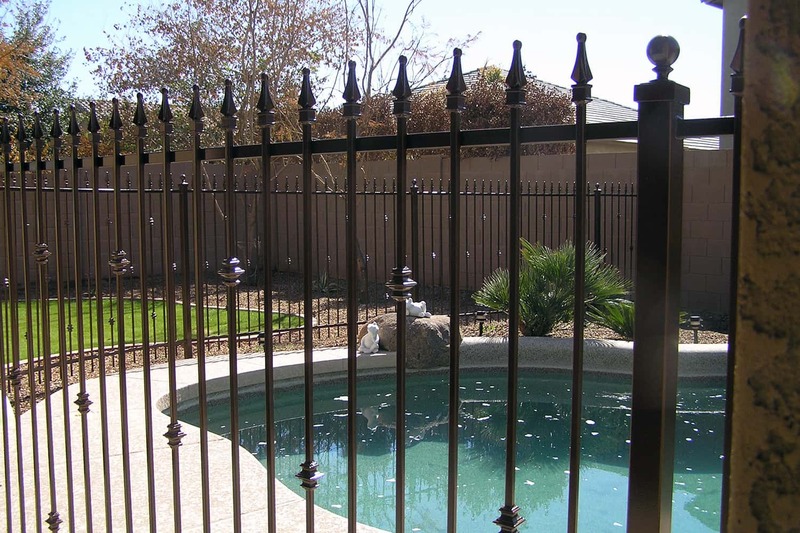 3-rail decorative pool fence mounted between masonry columns. 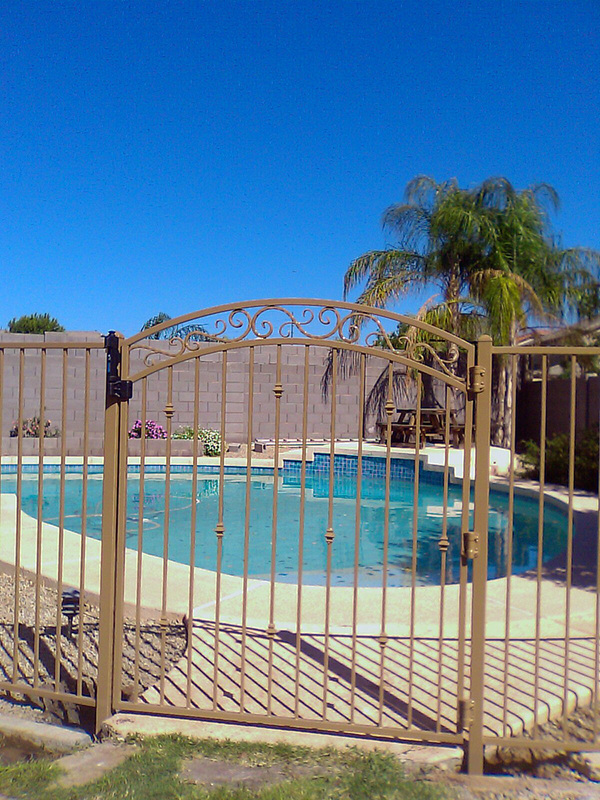 The arched decorative gate with 3-rail pool fence. Four foot wide arched decorative gate with Magna Latch. Twisted solid steel pickets alternating with straight pickets. 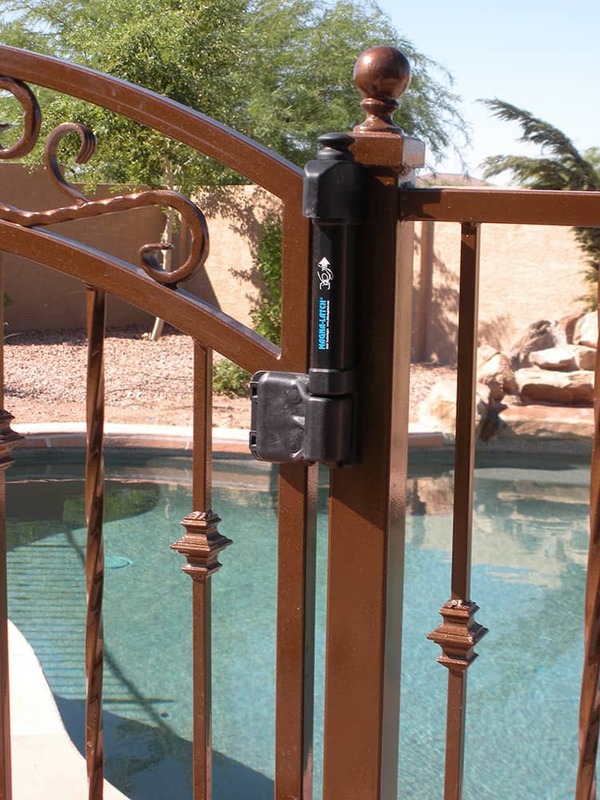 Magna Latch: the best pool gate latch you can buy! 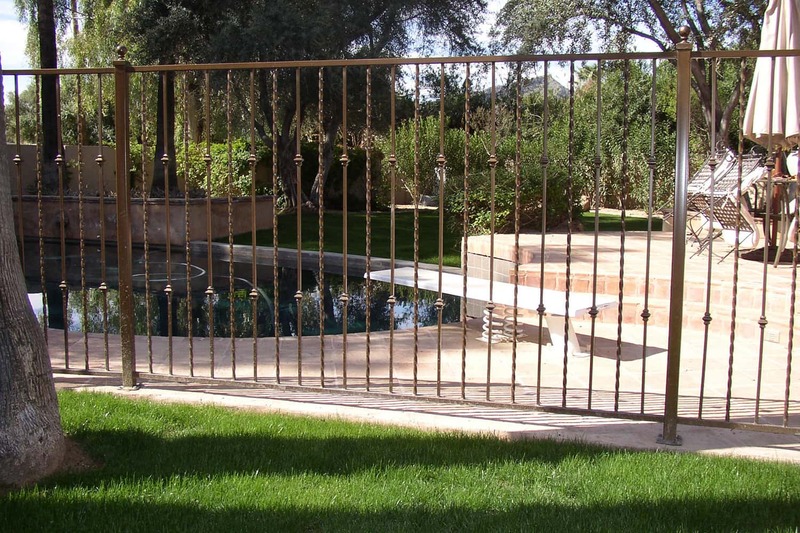 This pool fence adds a decorative hand-hammered casting. 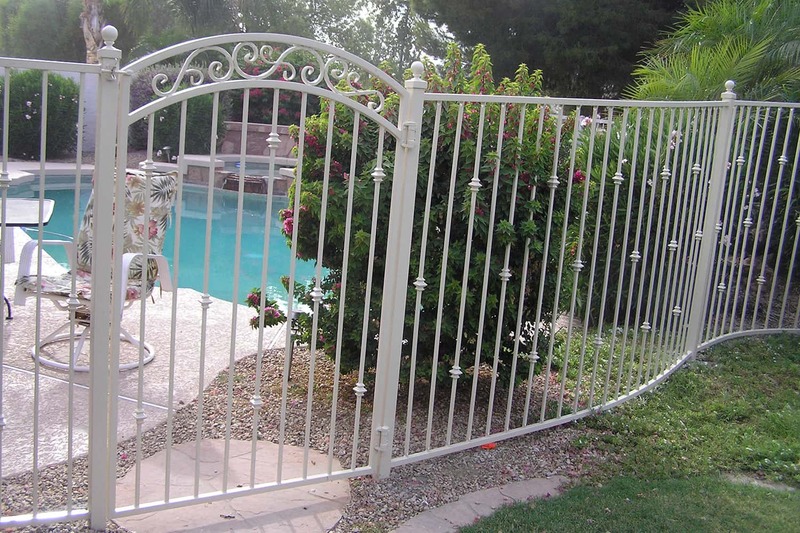 Decorative arched double 4' wide gates make a true 8' opening. 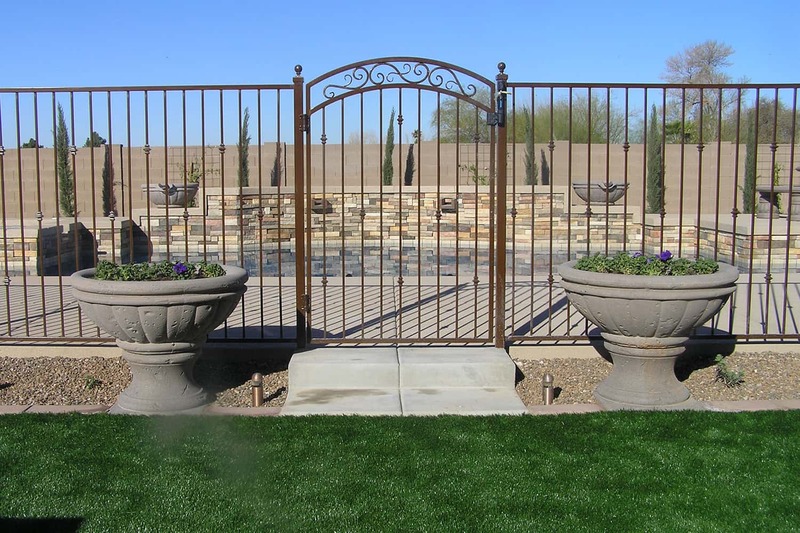 These 4' gates open completely to allow an 8' opening when these folks entertain in their backyard. The arched gates with the hand-hammered Italian scrolls are painted in our Tan Polyurethane to protect the steel from both water and sun damage. Standard pool fencing curved to follow the decking.